Hello there and Happy Saturday to you! Time for a new color challenge over at Dynamic Duos! This past week has been bittersweet as we had to say farewell to our designers for the past 6 months...but also welcomed the new team. To our designers from the past 6 months, THANK YOU! Such an awesome group of gals who continue inspire with their creations. To the new team, WELCOME! Looking forward to the next 6 months with you! I just love these colors together, don't you? As soon as I saw them I knew I wanted to make a Christmas card. 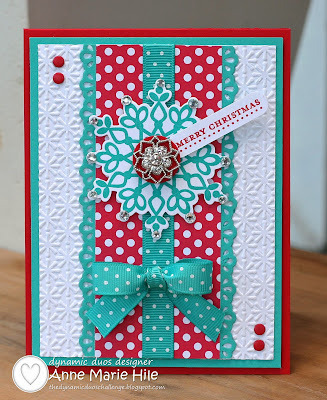 Out came the Festive Flurry stamp set and lots of polka dots and this is how it all came together. Of course, it needed some bling so I added some sparkles to finish it all off. So so pretty, Miss Lady!!!! Yes, these colors made a beautiful Christmas card along with your sweet design. Love it. Love your Festive Flurry card!! The colors look fabulous and I still have that same ribbon (need to dig it out) :-) I am so looking forward to designing with you for the next six months- have a great week! Anne Marie I love this card and that snowflake and die need to come home to me. Fabulous! I love this colour combo! This card is absolutely stunning! I love the colors and so excited to be on this team with you and the others!! These colors are definitely bold and cheery- and that is exactly what this card conveys, Anne Marie. That perfect little bow and glimmery embellishment are great finishing touches! What an adorable and cheery card! Love it! 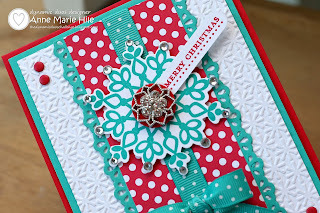 Beautiful card, Anne Marie--loving all the polka dots. They work so well with the snowflake theme. Also admiring your furry family, at left, esp Tomas the button and brad master--I can just imagine! 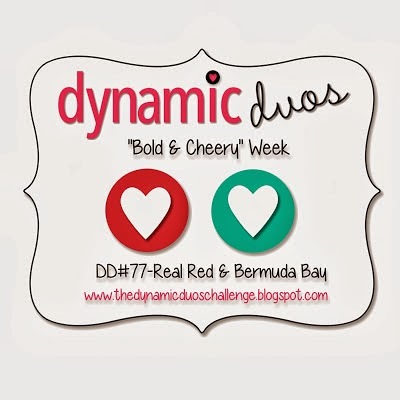 Thanks for the opportunity to play along with the Dynamic Duos! So pumped! WOW this is pretty and so very festive, love the colors! Wow, this is so beautiful! What a great color combo and I love what you've done with it! The polka dots are perfect and I love all the texture and bling! I have resisted buying this set along with the dies but I think you have convinced me I have to have them now! Stunning! I love how you layered so beautifully. Pretty ribbon too! This is so pretty Anne.. I love the touch of bling you added and that background you embossed. I'm looking forward to working with you on the DD Team.